The Mercedes-Benz R-Class was created for buyers seeking the driving characteristics of a good luxury sedan with more space and functionality. Mercedes calls the R a grand sport tourer, but in essence it’s a luxurious minivan. For 2007, the R-Class line expands with two new models. The diesel-powered R320 CDI eliminates just about everything bad associated with old-technology diesels except the outstanding fuel economy. The R63 AMG is powered by a hand-assembled 503-horsepower V8, with other mechanical enhancements that make it the undisputed hot rod of minivans (if the R-Class is indeed a minivan). Yet the best news of all applies to the price. Perhaps due to slower-than-anticipated sales, Mercedes has lowered the sticker on other R-Class models roughly $5,000, without a significant reduction in standard equipment. The R-Class has four conventional swing-out doors and a top-hinged, one-piece tailgate, like a station wagon. It has full-time electronically controlled all-wheel drive like many upscale SUVs, and it has three rows of seats, like the typical minivan. The R-Class is also quite large, though a good-looking wedge shape and sweeping lines help disguise its considerable size. This grand sport tourer is longer than many full-sized, truck-based SUVs. Its doors are among the longest on any vehicle, and they open to expose a spacious interior that comfortably accommodates six adults in nice, supportive seats. Whatever the R-Class is, we like it. Each of the four models accelerate, corner and ride like big luxury sedans, with the all-weather security of standard all-wheel drive and impressive flexibility for people and cargo hauling. All offer the passenger-friendly accoutrements of a mainstream minivan, including an abundance of cup holders and interior lighting and an optional DVD entertainment system. And all come loaded with passive safety features designed to protect occupants in the event of an accident. What’s New for 2007: Two new, very different models. The R320 CDI ($44,000) is equipped identically to the base R350, except that it’s powered by a high-tech, 3.2-liter diesel V6 with 216 horsepower and a substantial improvement in mileage. The R63 AMG ($87,400) is a hot rod for large families. It’s equipped with a 503-hp, 6.2-liter V8 hand built by a single technician at Mercedes’ AMG racing subsidiary, other mechanical enhancements and a long list of ultra-luxury features. The retail price of existing R-Class models was reduced nearly $5,000. So the 2007 Mercedes-Benz R-Class is now available in four models. Each is distinguished primarily by its engine, and all are equipped with a seven-speed automatic transmission, standard all-wheel drive and load-leveling rear suspension. The R350 ($43,000) is powered by 268-hp, 3.5-liter gasoline V6. Standard equipment includes leather seating, birds-eye maple trim, dual-zone automatic climate control, power-adjustable front seats, folding second- and third-row bucket seats, rain-sensing wipers, multi-function control buttons on the steering wheel, an eight-speaker stereo with AM/FM/WB/CD, an integrated garage door opener and lots of cup holders. The R500 ($50,500) has a 302-hp V8 engine. It also adds a six-disc CD changer, heated front seats, burl walnut trim, three memory buttons for seats, mirrors and steering column, TeleAid emergency communication, additional chrome exterior trim, tinted front and side glass, speed-sensitive steering and 18-inch wheels with 255/50 tires. Options include turning bi-xenon headlights ($900), Keyless Go automatic starting ($1,100), Airmatic suspension ($1,400), and three-zone automatic climate control ($1050). The Premium package ($4,225) includes the Panorama sun roof, with a five-and-a-half-foot glass section in two panels, the rear-seat DVD entertainment package, navigation system, a power tailgate, and TeleAid. The AMG Sport package ($4,500) includes Mercedes’ Airmatic air suspension, and it delivers the look and feel of the R63 AMG without the crazy powerful engine. Safety features include multi-stage front airbags and both side-impact and head-protection curtain airbags for all seats. Active safety features include anti-lock brakes (ABS) with Electronic Brake-force Distribution (EBD) and Mercedes newest electronic stability program (ESP). A tire-pressure monitor comes standard. What's new for 2007: The R63 AMG stands out for its more athletic appearance. Its 20-inch rims are the most obvious indicator, but the R63 also sports aggressive front and rear aprons, a unique grille and deeply sculpted AMG side skirts. The new R320 looks identical to the R350, except for small CDI badges that indicate its diesel engine. The Mercedes-Benz R-Class is a big machine. It's 14 inches longer than Mercedes' M-Class sport-utility vehicles and longer than the full-size Cadillac Escalade SUV, but lower to the ground than both, making it easier to step inside. The rear side doors are very, very long. That makes getting into and out of the second- and third-row seats easier, but it can cause problems in tight parking areas. With curb weight for the V8 exceeding 4900 pounds, the R-Class is heavier than some full-size SUVs. Expansive size pays dividends in abundant space inside the R-Class, as fully 65 percent of its volume is interior space. The typical sedan has a much lower ratio. Mercedes stylists have also done a good job disguising the R-Class's functional intent with a swoopy, appealing design. In many respects the R-Class is striking, and handsome. Its hood rises sharply into a large, steeply angled windshield, and sweeping front-to-rear lines tend to minimize its bulk and create some visual excitement. Sculpted front fenders flow back from multi-element headlamps, and an aggressive grille adds character. The bodywork also makes the R-Class a fairly slippery vehicle. Its 0.31 drag coefficient is lower than some sedans, and that helps minimize interior noise as air streams over the body surfaces. Four wheel packages are available, ranging from 17 to 20 inches in diameter, intended to add either a touch of elegance or a bit or racy style. What's New for 2007: The R63 AMG model has heavily bolstered sport seats in front, upholstered with Nappa leather and an Alcantara insert across the shoulder bolsters. The R63 also features a leather-wrapped sport steering wheel, unique instruments with AMG graphics and stainless-steel pedals with rubber studs. In function and versatility, the R-Class interior is very much like that in a good minivan (whether Mercedes appreciates that label or not). In design and finish, it's very much a Mercedes-Benz. The R seats six in three rows of two, as opposed to seven in many minivans. Each seat is individually adjustable, and all will accommodate a fairly tall adult in comfort. 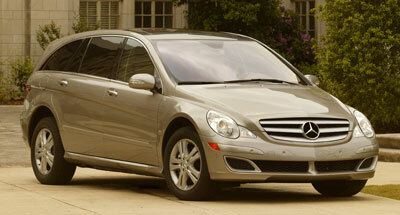 Materials used throughout are generally luxury grade, and all R-Class models come with wood trim. The driver's seating position replicates that in a minivan's: high enough that a big SUV won't completely obscure forward sight lines, but not off-road high. The six-cylinder models have a manually adjusted steering column, while the wheel in V8s tilts and telescopes with power assist. Glass in the R-Class is expansive, allowing excellent visibility in all directions. It also makes for a bright, airy ambience, whether the interior is trimmed in light or dark colors. The R-Class instrument panel is as luxurious in style, execution and materials as that in Mercedes' mid-size E-Class sedan. There's more chrome decoration than you'll find in most other Mercedes. The dash design is different than that in the M-Class SUV (the R's sister model), with an extra step along its length, but the gauge cluster, center-stack display and switch clusters are identical. The second pair of seats slides fore or aft six inches, increasing legroom for passengers in the second or third row as needed. Mercedes says there can be as much as 40 inches of space between the first two rows, and 30 inches between the second and third. All the rear seat backs recline, just like those in front. The second row has three sets of air vents, one in the rear console, the floor and the side pillars, and its own fan. Optional three-zone climate control allows separate temperature adjustment in back. The R-Class is loaded with conveniences you wouldn't find in Mercedes' big S-Class sedan 10 years ago. Every seat has a cup holder, an armrest, air vent and its own light. There are actually more cupholders than seats, and a built-in bottle opener. Entertainment choices abound. The optional dual-screen DVD system mounts LED screens behind the front headrests, and each will display a different input (a movie and video game, for example). The standard stereo has an MP3 jack and plays tracks from an MP3 player using the player's controls. The optional iPod connector will let you put your Apple iPod in the glovebox and play it through the stereo, using steering wheel controls to select tracks from the iPod menu, which is displayed on the dash. The rear seats fold, individually and in fairly simple fashion, to create a flat load floor. Cargo capacity ranges from 15.2 cubic feet behind the third row to an impressive 85 cubic feet with the rear seats folded. The maximum is less than a long wheelbase Chrysler Town & Country, with its slick stow-in-floor seats, but more than some full-size SUVs. Mercedes says cargo lengths approaching nine feet can be accommodated inside. What's New for 2007: Two engines. The 216-hp 3.2-liter diesel V6 in the new R320 CDI is state of the art, and as clean as the gasoline engines in other R-Class models. The high-performance 6.2-liter V8 in the R63 AMG delivers the torque of a large V8 and the free-breathing, high-revving character of a sports car engine, with racing style features such as dry sump lubrication. Get behind the wheel of the Mercedes-Benz R-Class and the minivan comparisons lose some of their weight. While the R is most like a minivan in its layout and interior flexibility (and maybe its appearance), it drives more like some big luxury sedans, and it's livelier than most minivans. Don't get the wrong idea. This is not a sports sedan. But when it comes to handling, the R-Class will do just about anything the driver demands, and more, without losing its composure. Put another way, the R-Class is much better to drive fast than the typical minivan, and very stable at speeds well beyond the legal limit. This vehicle can carry six people down the autobahn at 120 miles an hour while five of those people sip lattes. It's steady and buttoned down in all circumstances, and ready for a dash down a twisty road at fairly high speeds, without putting anyone inside on edge. Its front seats are more heavily bolstered than those in most minivans or SUVs. They keep occupants snugly in place, without being uncomfortable. The R-Class is nice and quiet, too, without the booming sounds that seem to float around the back portion of some minivans. At highway speeds, there's less wind noise than you'll hear in many other vehicles this size. The quiet environment means less fatigue for the driver on long trips, and easy conversation for all occupants, whether there are two or six. There is one exception to the solitude, to be sure. Especially with the 19-inch wheel option, the tires feel hard and stiff when they slam across pavement joints, and they crack Loud! It's not really degradation in ride quality, and it's an increasingly common occurrence on big luxury vehicles, as rims get bigger and tire sidewalls shorter. It's just a little out of character with the rest of the R-Class dynamics. The 17- and 18-inch wheels are going to offer the quieter ride. The V6-powered models are more than adequate for most driving, chauffeuring, and touring duties. There's power in reserve for safe, anxiety-free passing on two lane roads. We'd choose the diesel-powered R320 CDI, assuming diesel fuel was readily available within our appointed rounds. Acceleration times to 60 mph are nearly identical for the R320 and gasoline-powered R350, yet the diesel is noticeably quicker to say, 40 mph, or immediately after the transmission downshifts when you pull out to pass, thanks to it's considerably higher torque rating. Yet for all intents and purposes, the diesel is as smooth and quiet (and odor-free) as the gas V6. It also delivers a real-world fuel economy improvement off as much as 30 percent, and it has much greater range on a tank of fuel. That said, the V8-powered R500 is even more satisfying to drive. Just step on the gas and go. The R500 has more grunt than any family hauler needs, and gets itself around anything dawdling in its path without breaking a sweat. Also, the V8 is a bit smoother than either of the V6s. Mercedes calls its R-Class a grand sport tourer. We'd call it a minivan, without a hint of disparagement. The R-Class is stylish and luxurious, with plenty of function. In seats six adults more comfortably than almost any vehicle on the market, with plenty of entertainment options for those inside, and it easily converts to carry a lot of stuff rather than people. It's more satisfying to drive than most other minivans, and it can accelerate faster than some luxury sedans. All-wheel drive makes it great for the wintry conditions, and it will easily fit in most garages. NewCarTestDrive.com correspondent Jim McCraw filed this report from California; with Jeff Vettraino reporting from Detroit. Head/hip/leg room, f: 39.8/60.3/39.8 in. Head/hip/leg room, m: 40.4/59.6/36.2 in. Head/hip/leg room, r: 37.2/52.8/32.4 in. Cargo volume: 85 cu. ft.